Scott Walker may be polishing up his resume, now that the recall signature effort has likely passed the halfway mark (here) less than two weeks after it started. If so, he should use grammar check and have some folks look it over before he sends it out. He (or somebody on his staff on his behalf) tweets regularly. 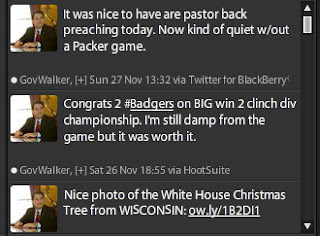 Most of the stuff is utterly mundane … see the middle one in the picture here, about him being damp from the Badgers game (it was raining). And sometimes they have political barbs ... see the third one, where he refers to the White House holiday tree as a Christmas tree, as he has consistently referred to the Wisconsin one, contrary to now-normal usage. But whoever wrote today's tweet (top one in the pic) blew it. I've seen 'are'/'our' confusion in spelling before and hear people pronounce 'our' like 'are', basically [aɹ] or [aɻ]. Linguists are always quick to stress how trivial spelling is, even in a prescriptivist/standard context, but this kind of thing can stick and take on a life of its own if it seems to confirm a view people already are inclined to hold about somebody, I guess — remember Dan Quayle and 'potatoe'? Still trying to figure out what "damp from the game" means. Someone else on Twitter replied that they were "damp from thinking about Walker's imminent recall", or words to that effect. It was pouring rain during most of the game. If he was there and not in the luxury suites, he was at least damp. I don't think there's anything necessarily political about calling the White House Christmas tree a Christmas tree. That's how the White House blog refers to it. O.M.G. For years, it was a holiday tree here and Walker made a big deal of calling the state one a Christmas tree, and I jumped from there. Thanks. Don't guess there's any chance that's an auto-correct error / Cupertino effect, is there? 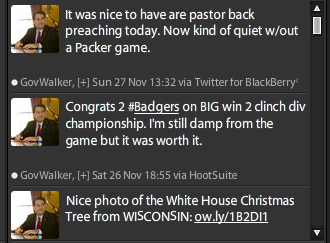 I'll bet there are a lot of Republicans who today are sad they boughten all the lies Mr. Walker has tolt us. Are little tree was damp when I took it out of the garage but it is dried out now in the living room. It is plastic and sure glows pretty.